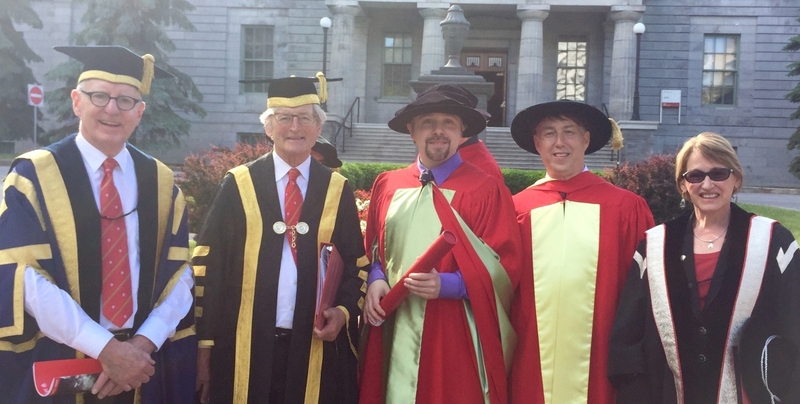 This year, the McGill convocation of the faculty of science highlighted the McGill efforts in Green Chemistry. Paul Anastas, the director of the Center for Green Chemistry and Green Engineering at Yale University, who is well known as the "father of Green Chemistry", received a honorary degree and delivered an inspirational address to the graduating students. Encouraging them to embrass the challenges of the future, he told them: "Change is happening, what we need are change-drivers". Tomislav Friscic received the same day the Principal’s Prize for Outstanding Emerging Researchers for his work on developping mechanochemical reactions for the green chemistry applications in the fields of pharmaceuticals, gas storage and energy. It was also a very special moment to honor and celebrate all our studnets graduating this year with a BSc, MSc or PhD from McGill Chemistry. Photo: From left to right, Kip Cobbett, chair of McGill board of governors; Michael Meighan, McGill chancellor; Tomislav Friscic, 2016 Principal’s Prize for Outstanding Emerging Researchers; Paul Anastas, 2016 McGill doctor honoris causa, Suzanne Fortier, McGill Principal.